The history of the town of Tarnos which counts more than 12000 inhabitants, is intimately bound to that of the river Adour. Until the Middle Ages, the river enlarged to the ocean further in north ( Capbreton, vieux Boucau). 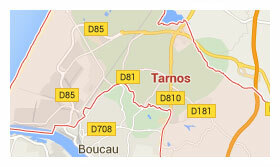 Tarnos became the estuary when Bayonne diverted the river and damed her mouth in 1578. The arrangement of an industrial port (steelworkers) allowed an important economic developpement from 1880 to 1965 and the employment of several thousand workers. Most of these lived in the "Cité des Forges",today classified as a listed district. Although the new rolling mills was installed, companies of high technologies supplanted from now on the activities of the iron transformation. More recently, the city acquired a Social Economy and Solidarity pole South Aquitain who joined the company restaurant (SCIC Eole) on technological space Jean Bertin. However, Tarnos offers a particularly preserved natural heritage. We distinguish district Barthes (wetlands from the edge of the Adour) of the typical Landes littoral zone (ocean, dune, pine wood ...). In fine weather, the beach slightly developed but supervised in summer, allow to play on the sand and in the waves. The trails and the bike's path Vélodyssée under forest cover facilitate the practice of hiking on the other side of the dune. The inter stadium, skate park ... complete range of sports equipment.